Pinhaw Beacon is a fine vantage point and this North Yorkshire walk starts from Lothersdale and uses the Pennine Way to reach the summit. The return route follows moorland and field paths back to the start. Map of the 270 miles (435km) Pennine Way National Trail, between Edale in the Peak District and Kirk Yetholm in the Scottish Borders. This booklet is included with the Cicerone guidebook to the trail, and shows the full route on Ordnance Survey 1:25,000 maps. This popular long-distance route typically takes three weeks to complete. North Yorkshire is a large county and contains some of the finest walking Britain. The Yorkshire Dales and North York Moors National Parks offer varied routes to suit all abilities with wonderful scenery. 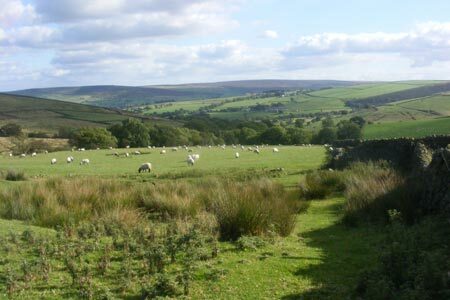 Outside of the two National Parks, there are many walks offering rural tranquillity and pleasant walking. The Pennine Way, Dales Way and Coast to Coast long distance paths offer excellent circular walks exploring the landscapes of this historic county.